Pale-morning duns, dead and dying from their exhaustive mating efforts, spun lazily down to the river’s surface. I stood in the middle of a big slick, halfway between where the riffles ended and the current essentially disappeared. Fish rose, snacking on the spinner fall. I grabbed a size 18 PMD spinner, tied on some 6x tippet, and found a feeding trout within casting distance. The day had been windy as hell, so I’d ditched my little 6’ 4wt bamboo rod in favor of a 9’ 5wt Sage VXP. That particular rod makes broomsticks look like sensitive fishing instruments. As the spinner fall started, though, the wind stopped, which meant I got to put away my wind cannon and fish with a proper dry fly rod. The sing-song tone of my Hardy Duchess danced across the water as I stripped enough line to make the cast. My first few false casts resulted in tailing loops. Slow down, I thought. It’s bamboo, not graphite. Now in the right mindset, I threw a 30-ish foot cast in front of a rising trout. The spinner passed through its kitchen — and the fish took advantage. I set the hook, my reel screamed, and the whole rod bent into the cork. I felt every beat of the tail, each shake of the head, as the fish ran. I grinned like a teenager finding dad’s liquor cabinet unlocked. That scene was exactly what I’d gone fishing for that day. A big mayfly-eating trout on the end of my bamboo rod, a rod that lets me feel the weight of the fish through the cork and into my hand. It’s an intimate, almost hand-to-hand combat experience you don’t get with graphite. And for a kid who grew up fishing dries to cutthroat in small Rocky Mountain streams, it’s about as perfect a fly fishing experience as I’ll have. But bamboo isn’t just for old guys in tweed with pipes and bowties, or anglers like me who grew up in a family that treated dry fly fishing like a religion. Fishing bamboo is part of angling’s storied tradition, and something I think every fly angler should try at some point. If you need more convincing, consider these three reasons to try out bamboo this year. More folks are building bamboo fly rods today than ever before. Hobbyists make up the majority of the rodmaking community these days, even though companies like Thomas & Thomas, Winston, Orvis, and Scott still build bamboo. Modern builders - hobbyists and pros alike - have grown the wealth of knowledge from builders like Everett Garrison, Jim Payne, Paul Young, Lyle Dickerson, and Wayne Cattanach to the point that rods are being built to a level of excellence never before seen. Fishing a modern bamboo rod isn’t like grabbing your grandpa’s dusty old stick. They’re not noodles, or outrageously heavy. Yeah, bamboo is heavier than graphite, but that’s always been the case. But from tapers to components, there’s never been more high-quality cane available for anglers. I can’t remember who said it, or where I heard it, but it’s been said that graphite fly rods are for shooting line, while bamboo is for casting it. Graphite rods are great, but they lack the feel and finesse of bamboo. Since bamboo isn’t as stiff a material, it generates slower line speeds and bigger loops. That all adds up to a slower casting stroke, forcing you to pay attention to the timing of your cast. And you end up paying attention to a lot more about the entire process of fishing, too — especially how your line lays down on the water and the quality of your fly presentation. Some anglers might be bothered by all the extra time and work it takes to cast bamboo, but it makes you better if you’re willing to learn. The nuances of fly casting are lost in fast-action graphite rods. That’s neither good nor bad — it’s just a fact. But you’ll end up far better at casting if you spend time with bamboo. Aside from the history and tradition behind bamboo, I keep these rods in my quiver because they’re just so different from any other rod. I reckon I’ve fished and reviewed a hundred different rods in the past decade, and none of them have the personality or character of bamboo. Each bamboo rod is so unique that you’ll never find two that fish quite the same — even if they’re the same taper, built by the same rodmaker. And that’s not to mention the variety inherent in the craftsmanship and components of bamboo rods. You’d have to custom-order a graphite rod to get it with a colored agate stripping guide, or even a downlocking reel seat. Those are generally standard features on bamboo, and they’re little touches you don’t see elsewhere in the angling world. Bamboo ain’t perfect, but you’ll have a helluva time fishing it. Ask around local angling clubs, TU chapters, and fly shops, and you’ll find someone who either builds or owns bamboo. Chances are they’re more than happy to bring you into the unique underworld that is fishing bamboo. Have you ever fished bamboo? If so, what did you think? Let me know in the comments. 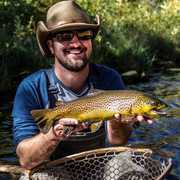 #AskTheGuides: Why - and How - You Should Avoid Spawning Cutthroat Trout Here are three tips to protect cutthroat – and promote healthy river ecosystems.